I recently received an urgent midday call from my wife to find out if I would run down to our local physician's office to get my flu shot (my wife is slightly health obsessed – she carries a bottle of Purell with her wherever she goes). "There's only one other person here waiting and they just got their supply in," she exclaimed. So I joined her, and even though 30-plus years of patients breathing in my face has given me almost Superman-like immunity, I surrendered my arm for the vaccination. What I noticed most about the visit were the charts the assistant carried into the treatment room. We have been patients at this practice for 20 years and our charts were as thick as New York City's Yellow Pages. My wife commented on the assistant's biceps from having to carry those charts around all day, but all I could think about was the nightmare of storing and accessing all the information in the limited storage space I had in my own office, not to mention all the trees sacrificed for the sake of keeping medical records. Then I smiled, because five years ago I enacted a plan to digitize my office files, and thanks to my chairside assistant, Kim, who has spent the better part of her office downtime for the last several years scanning old charts and X-rays, the paper beast is no longer a problem for us. I dealt with this issue, as well as others in my dental practice, by embracing technology, and although there has been aggravation at times (e.g. : "Dr. Z, the computer crashed and I have no access to the appointment scheduler! "), technology has been a terrific friend to me, an extremely dependent "employee," and the source of many comforting nights' sleep knowing that another challenge has been dealt with successfully. Utilizing technology demands careful planning, budgeting and the ability to foresee which technologies make sense to deploy for an individual situation and which ones are better left for others. I think digitization of patient charts is the granddaddy of technology in the dental office, requiring a reasonable level of experience with computers (or a readily accessible tech geek), but it can prove to be one of the most satisfying and efficient deployments of technology to date. My journey began in 1984, just five years into private dental practice. I had almost no computer experience, except for the Atari 800 personal computer which I purchased a year or two earlier. I taught myself some basic programming and played around with online banking with a 300 baud modem and a green monitor. Paying a handful of bills online back then took about an hour, but I envisioned the computer being a useful tool in the future and felt it was a time investment that would be worthwhile. When the IBM product center opened in my town in 1984, they advertised a turnkey system for dentists for under $10,000, and I jumped in headfirst and immediately put to use my first office employee. Mind you, the ORD-Systems software package – which was half the investment – was awful. The last straw came a year and a half into using the system when it locked up on a weekend when we entered our thousandth patient. Other systems were hitting the market as well as new computers that were two to three times faster than my PC-XT with 512K ram and 10MB hard drive. One that caught my eye was Three Star Dental by Dr. Jeffrey Tiefer. I liked that he was a dentist and he offered the full version of the system for a free trial with a purchase price of $1,000 if I liked it after evaluation. The software was a big hit. I'm happy to say that 25 years later, I still use Jeff 's software, now Diamond Dental Systems (and yes, he has been there for me on weekends when I have needed support). In 1995, I wired my home office and my three-operatory practice, for networking and added PCs to the operatories. This gave me a problem-solving tool I never had before. It seemed extremely counter-productive to me to have several staff members answering the phones to make appointments when there was only one appointment book. The book was constantly being moved around and, "Who's got the book?" was a familiar cry in the office. I urged Jeff to look into online scheduling and he came through. The staff was extremely resistant as you would expect. Of course they quickly adapted to the search features which enabled them to do things more efficiently. Even better, the "appointment book" was now in every room of the office at the same time. Within a short time they laughed at their reticence in giving up the book and agreed the computer was indeed a good friend. My next biggest technological embrace was the conversion to digital radiography. I hated waiting five minutes for the peripro and another few for the assistant to mount the X-rays, and presenting a treatment plan to the patient with tiny films on a view-box. Let's not mention the cost of film, chemicals, cleaning bills and new uniforms for staff whose clothes were ruined by fixer, and the wasted time that could be used more productively. Although many of my colleagues refuted dropping $15,000 for something they "can already do and can't charge more for," for me it was a no-brainer. We had monitors on each chair and the look on the patients' faces when you blew up their decayed tooth to the size of the full screen made selling treatment plans easy. In addition to better case acceptance, film and chemical savings, this freed up staff time. The convenience of electronically sharing radiographs with colleagues and insurance companies, as well as the intangible "wow" factor should not be overlooked. Over the years, my patients have looked up to me as a technological "Inspector Gadget," but they appreciate the technologies I have embraced because I have selected ones that I think are most practical and that will make my life easier and my patients more comfortable. Along those lines, we added D4D Technologies' CAD/CAM system, E4D Dentist, last year. The ability to deliver same-day restorations is something any dentist would drool over, but most consider to be too pricey an investment for their practice. A closer look reveals that using the Section 179 tax credit and putting the machine into service in December makes this toy wonderfully affordable. I saved almost $50,000 on my 2009 tax bill without laying out a cent until June 2010 and the savings in my lab bill easily offsets the monthly lease payment. Let's again not forget the "wow" factor. Even patients who don't need a crown get to see one being made and the virtues of the system are displayed on the 42-inch plasma in the waiting room while they wait. When it came to digitizing the patient charts in 2005, it was less about "wow" and more about "how," although the "wow" was certainly not lost. Rather than having a new technology thrown in my face and evaluating its worthiness for my office, digitizing charts was different. I recognized a problem for which there was no easy technological advance to solve. I looked at each item in the patients' hard chart and each had its own challenges for the conversion. Although we had been taking digital radiographs almost exclusively since the late 90s, we had many patients of record from the 80s and records from previous dentists were almost always film. It took a lot of research to find a scanner with a large enough scan area to handle scans of full series or panoramics in one pass. The Microtek Scanmaker 9800 XL was up to the task and it has scanned thousands of X-rays for us over the last five years without once going out of service. We still put it to use when patient records come over from other dentists that are on film. For paper scans we use Canon's DR-2010C sheet-fed scanner. We have two of these babies in our administration areas. They take up very little room and do a great job of converting single sheets or stacks of sheets into PDF or JPEG files for photos and printed X-rays. We have a simple folder system with a main patient charts folder and 26 subfolders for each letter of the alphabet. Within the subfolders our patients have their own folders and within each patient's folder are subfolders for things with multiple entries like explanations of benefits, referral notes, scanned X-rays, photos, insurance benefit information, medical history forms, perio charts, etc. Folder privileges are set so that employees can add patients and folders but only a few, myself included, can delete or move a file. An external raid-compliant backup drive attached to the server updates every hour to constantly back up office data in the event of a power outage or heaven forbid, server failure. Daily incremental backups are automatically uploaded online using Amazon's S3 online storage system at about $20 per month. In the event of a local catastrophe, records are always retrievable from an offsite location. New patients now complete their medical history and information forms on our Web site and submit them to us electronically via e-mail. We then use a PDF-creating virtual printer like CutePDF to electronically save their files to their respective digital charts. You don't have to lose the paper all at once. Start slowly with new patients at first. Most practice management software systems now accommodate treatment notes. Buy the sheet-fed scanner first and stop creating new patient charts tomorrow. After a short while you will realize the benefits and start converting your old charts one by one as patients come in for their visits. Non-returnees don't get scanned and eventually their charts get discarded after seven years. Benefits include smaller storage requirements for charts; never "losing" a chart again; quickly finding one item you are looking for in the chart without shuffling through pages; easy transferability of patient charts to other dentists, specialists and insurance companies; and of course, the "wow" factor! I'd be remiss if I didn't admit that there were times that it was a good thing there wasn't a sledgehammer around. My wife has had to put up with my bad mood on plenty of occasions when the technology didn't perform as it was supposed to. All in all, my journey with technology in the dental office has allowed me to be more productive, have more fun in the office, and attract and maintain a patient base with confidence in their practitioner. 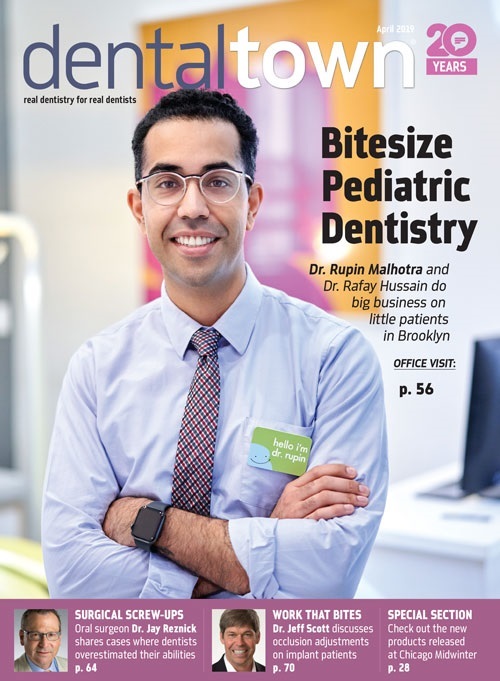 It has helped me arrive at a stable solution to the difficult issue of record-keeping that is becoming ever more of a challenge for dentists both today and going forward in the digital age.